Submitted photo Under a pilot project, Wright State University is negotiating lower prices for textbooks and online access content on behalf of its students. FAIRBORN — A pilot project at Wright State University called Inclusive Courseware that promises to dramatically reduce the cost of textbooks and/or online access content for students has saved them more than $56,000 — an average savings of 40 percent. The results were presented to the Wright State Board of Trustees on Feb. 16. Nine high-enrollment courses participated in the spring semester pilot. Estimates for an expanded pilot in the fall semester involving 40 courses are for a savings of about $300,000 for courses utilizing printed textbooks and $110,000 for courses utilizing e-books. In addition, a textbook auto-adopt policy is being implemented on a limited basis for fall semester. The Wright State Bookstore anticipates using the policy to adopt textbooks for between 100 and 150 courses and conservatively estimates savings at $200,000. 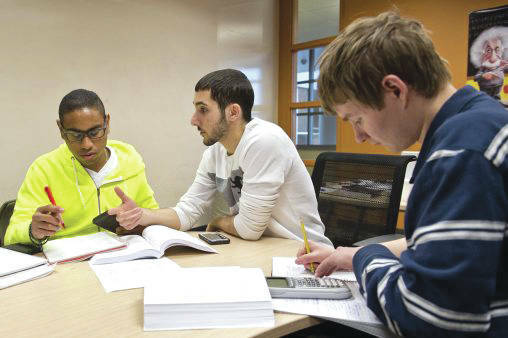 Wright State is collaborating on a study on the cost of textbooks with institutions in the Inter-University Council of Ohio (IUC), an association of Ohio’s public universities. Each institution will determine the cost of the highest enrollment major in each of eight areas, which will cover more than half of the undergraduate student enrollment. Wright State will work with the Barnes and Noble bookstore to obtain costs of new, used, rental and e-books for the selected majors. Wright State’s “inclusive access” pilot project enables the university to negotiate the price of textbooks and online access content on behalf of its students, using their collective power. Professor Dan Krane, chair of the Ohio Faculty Council and chair of the Wright State Task Force on Affordability and Efficiency, has been on a team developing the program from the start. He says textbook costs have significantly outpaced inflation for the past 15 to 20 years, a trend that studies have shown has adversely affected student performance and the way faculty teach courses. Students know they are benefiting from the pilot program when they see the description “Inclusive Courseware” for a fee that will be associated with the course when they register. If inclusive access was adopted by all of Ohio’s four- and two-year public colleges and universities, Krane says, it would save students at least $300 million a year. The pilot project comes in the wake of a recommendation by the Governor’s Task Force on Affordability and Efficiency in Higher Education that all institutions of higher education in Ohio explore means of reducing the cost of textbooks and report annually on their progress. Members of the working group included Krane; Austin Rains, student member of the Board of Trustees; David Baugham, Student Government president; Thomas Fenton, chair of the Faculty Senate Undergraduate Student Success Committee; Jennifer Gebhart, manager of the Wright State Bookstore; history professor Carol Herringer; Nova Lasky, director of strategic initiatives and stakeholder relations in the Division of Business and Finance; Jamie Norris, director of auxiliary services for Business Services; and Craig Woolley, the university’s chief information officer. Members of the implementation group included Bursar Steve Sherbet; Registrar Amanda Steele-Middleton; Daniel Palmer, of the Student Government Association; Amy Barnhart, assistant vice president and director of financial aid; and several members of the working group. To apply to Wright State visit www.wright.edu/admissions. https://www.fairborndailyherald.com/wp-content/uploads/sites/50/2018/02/web1_pilotprm.jpgSubmitted photo Under a pilot project, Wright State University is negotiating lower prices for textbooks and online access content on behalf of its students.